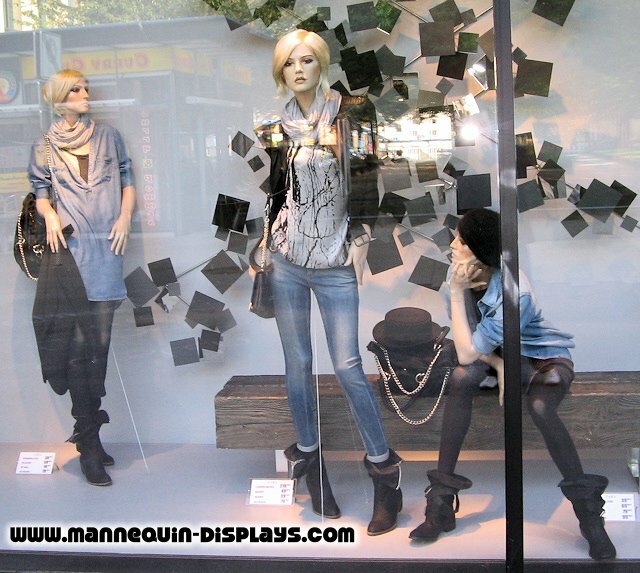 Window dressers often have to ask themselves how the best presentation of retail mannequins can be achieved. Often, wigs are part of the solution for this problem. Retail mannequins complemented with wigs are often more lifelike and realistic compared to mannequins without wigs attached to them. Unfortunately, wigs are seldom delivered together with mannequins by the store fitting retailers. One reason for this circumstance is the often changing trends of hairstyles, so wigs often get obsolete quite fast. This is why window dresser often choose the suitable wig according to what suits the planned store window composition best. This is especially true for the presentation of ladies fashion with female mannequins, where wigs are more or less essential. For this years spring collection, wig with short cut hair seem to be in vogue, while wigs with long hair seem to be the preferred choice for presenting the autumn and winter collections. Admittedly, the usage of wigs is not always advisable: for example, this is the case with modern stylized and single-colored mannequin and headless mannequins, which are better used without one or won’t support one, for obvious reasons. 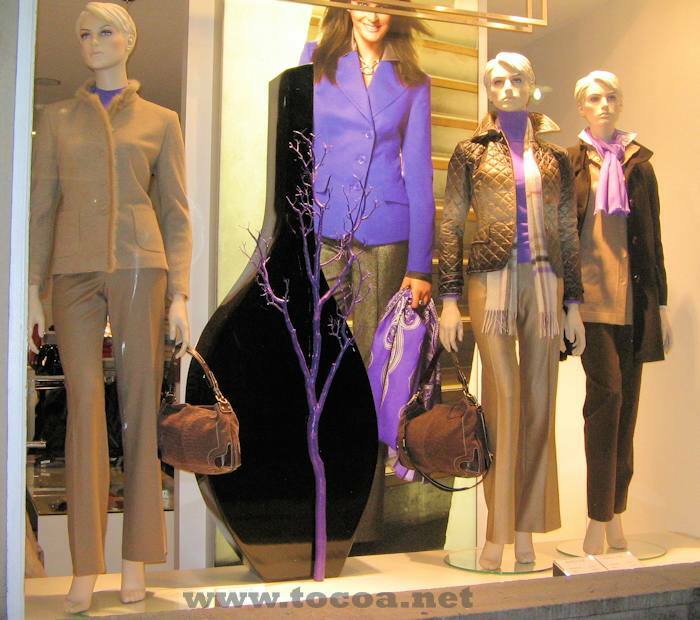 Self-adhesive foil used for window dressing has many advantages. One of the main advantages being that one is able to create a relatively effective advertisement for relatively little money. This kind of foil used for advertising purposes is available in many different sizes, ranging from very small to xxl size and can be tailor made to suit your needs or fit into your shop window. Given the fact that the foil can be custom designed, it is even one of the most price efficient means of outdoor advertising. 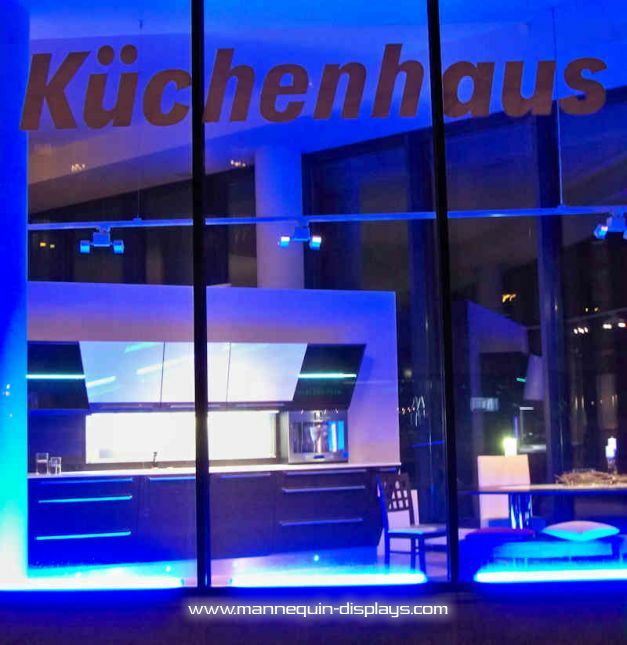 Besides being an effective advertising means, the foil is also able to screen the interior of a shop from outside views. In view of the possible colors, todays modern printing technoloy allows for a multitude of colour shades with high brilliance, often coming close to the quality only known of glossy magazines. Also, the advertisement foil can be made to stand out, forming some kind of three dimensional effect. By deciding for a very robust and weatherproof material, you will be able to benefit from your advertisement foil for a long time. There aren’t many alternatives to advertisement foils that are comparably effective in regards to low price and high efficiency. One of the favorite masks by Venetian carnival goers are filigree metal masks. These posh metal masks have been considered as a luxury and stylish masks for masquerade balls not only in Venice, Italy; but also in masquerade parties everywhere. These types of masks are popular for it features delicate metalwork with designs of jewelry that include gold, silver and Rhinestone. The filigree metal masks has exquisite stitches of lace, curves and motifs, often inspired by French and Italian work designs. The filigree metal masks involves elegant and graceful threads, usually delicately soldered together to create a discriminating piece of artwork. The craft-work involves meticulous finish and feel which makes the metal masks a must have in any masquerade ball or parade. The masks are beautiful and stunning, which makes it an eye-catcher in itself. If you wear the masks, be ready to attract attention for you will surely have them in your way. Wear filigree metal masks and be part of the sophistication of the Venetians from distant past.